Rated at 22,000 to 35,000lbs. Komatsu puts its technologies and know-how into the design and construction of the EX50 engine. With its four key, cutting edge technologies, the engine provides better fuel efficiency, maximum productivity, and lowered operating costs. The wet disc brake system offers increased durability in even the toughest work environments. The EX50’s excellent visibility, operator comfort and ease of operation are all designed to deliver greater operator productivity and efficiency. The EX50 features a standard wet disc brake system that offers improved durability and performance over a traditional drum brake. Due to its dustproof and waterproof enclosed design, the wet disc brake system can deliver high durability, resulting in reduced maintenance costs over time. Regardless of your working conditions, the wet disc brake system can have a positive impact on overall operating costs. Komatsu’s HSC mount system raises the operator’s cab from the vehicle chassis with a hydraulic suspension system that absorbs most operational vibration. This greatly helps improve operator comfort to reduce fatigue even during long work shifts. High pressure compressed fuel is stored in an accumulator chamber called a common rail. The fuel is injected into each cylinder at the proper time by an ECU (electronic controlled unit). This high pressure compression rail system optimizes fuel burn and greatly reduces fuel consumption. KOPS Plus – standard on the EX50 – locks out lift, lower, tilt and traveling functions when the operator leaves the seat for more than three seconds. They do not resume until the operator returns to the seat and resets the controls. A flashing yellow warning light alerts the operator when the KOPS lock is activated. In addition, the forks cannot be lowered while the key is in the off position. Operational visibility is greatly enhanced through improvements of the shape of the top of the counterweight and through an increased distance between the inner mast rails. Rearward visibility has been improved through a downward angle to the top edge of the counterweight. Also, forward visibility has been improved by repositioning the lift chains to the outside rail. 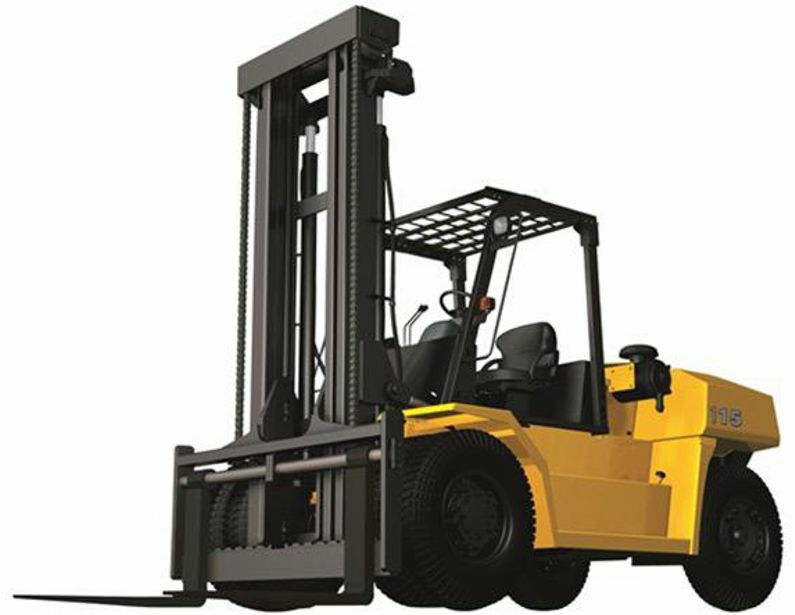 A highly rigid frame enhances truck durability and load handling performance. Use of a main frame structure that consists of a single piece of thick plate steel provides high rigidity against twisting caused by static steering, turning, or uneven surfaces resulting in excellent truck durability and load-handling performance. The EX50’s large fuel tank reduces the need for frequent fill-ups and easy-to-see inspection windows show fuel and oil levels. A unique air cleaner automatically ejects airborne dust to reduce clogging of the filter element, thus improving suction efficiency and improving filter element life. A reserve tank for engine coolant keeps the system at a constant level and eliminates the need for frequent refills.